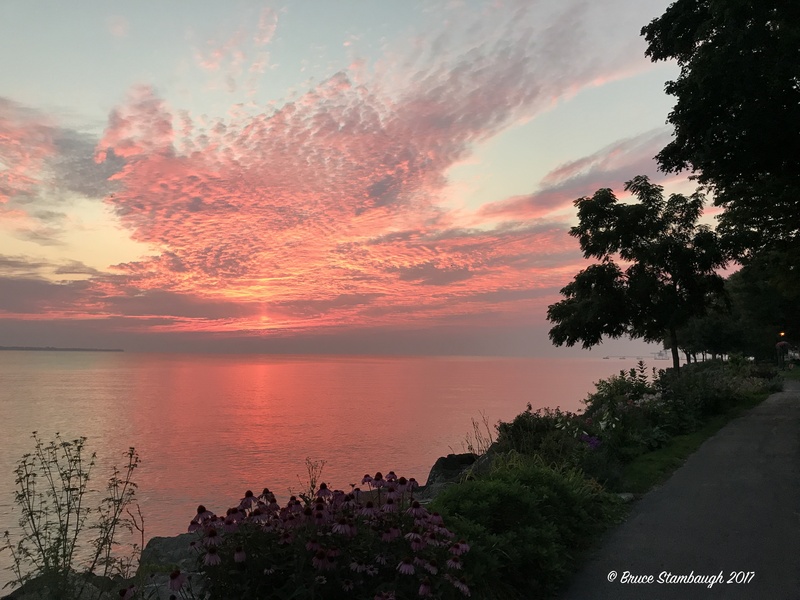 When we vacation at our beloved Lakeside, Ohio, I try to start each day with a morning walk, weather permitting. I usually rise before sunup. I quietly as possible open the door of our efficiency apartment so not to wake my still sleeping wife. Each day is different. Some days, it’s like stepping into an oven. Others, I wear a jacket. Nevertheless, I always check the southern sky for any hint of what I might find at the lake. Though the route is usually the same, I marvel at the newness of each walk that still surprises me even after all these years. I’ve learned to watch for it, inhale it, listen to it, and even taste it in the dense, moist air thick enough to cut with a knife. I hope for those incredible pink and blue hues that dance at dawn. Often only the grayest gray greets meet. Undaunted, I head to the lake anyhow, past cute cottages, past overflowing garbage cans waiting to be emptied, past flowerbed after flowerbed, the blossoms bent with the weight of the overnight dew. Despite the early signs of another blessed sunrise, this day a thick fog has painted shut the horizon. There is no deciphering sky from water. Only billowing clouds high above the fog bank give depth perception. The lake is as placid as it could be. No boats. No birds. Only an occasional fish jumps rippling the surface like a drip in a bucket of water. The circles soon conform to the calm. No breeze blows. From far across the smooth waters, the resonating horn of the first ferry to Put-In-Bay reverberates across the glassy surface. I walk east hoping for a miracle from the sun. Other options peak my senses instead. House sparrows chirp their morning chatter. Robins merely chip and chortle now instead of issuing their luxurious morning spring and early summer concerts. Besides those few birds, I am nearly alone. I walk along the paved path that stretches out ahead of me. Beds of black-eyed Susan’s and day lilies are the median between the walkway and the rocky riprap shoreline 10 feet below. Clearly, today is not yesterday when a goose chased an eagle just overhead as the sky blushed every shade of pink. Today the air hangs heavy in the damp grayness. Sure no flashy sunrise will emerge, I turn my attention to the walk itself. At my friend Dottie’s cottage, the only one in Lakeside with a four-digit house number, I head south on Poplar Street. It’s all up hill from here until I reach where Sixth Street ends at the new memorial park. The gurgling of a fountain is the only sound there. A female redwing blackbird preens on the phone line above me. The bird’s daybreak hygiene continues as I walk by. A pair of scraggly squirrels saunters across the street in search of breakfast. I head down Cedar Street but soon stop. The biggest skunk I have ever seen wattles across the blacktop, going house to house in search of any remaining morsels. A jogger passes a speed walker ahead of me, the first two humans I have encountered. We smile, wave, and say good morning, exercising the Lakeside protocol. So there it is. No two days are alike. What was yesterday is gone. What will be tomorrow is unknown. All that truly is, is today. Let’s embrace it as it unfolds! Thanks, Beth. It’s mine, too, if I can get myself out of bed in time to enjoy it. All days should begin thus. Idyllic. Thanks Bruce for taking us with you on your early morning walk, beautiful photo’s. I’m glad you enjoyed the walk, Pamela. This is by far your most beautiful and inspirational article yet! The pictures are breathtaking and show your love for God’s awesome Nature. Your words are much needed pertinent advice to help us slow down and ‘stop to smell the flowers’ in today’s busy world. Looking at this was like a ‘mini vacation’ for me! (I haven’t had one for 9 years). I’ve heard so many good things about Lakeside, but unfortunately have never been there. Take good care; I’m looking forward to your next article. Thank you so much for your kind words, Debbie. I am glad you have found inspiration in my words and photos. Lakeside, OH is indeed an inspiring place. Please try to visit it sometime in the summer. And try and sneak in a vacation soon, too. Good Afternoon, Bruce. I can honestly admit… I felt as though I was on the same path with you. The simplicity of your surroundings came to life as if I was truly present in your moment. The pictures were an added bonus. I don’t know if this is your journey of meditation, but it certainly relaxed me. Thanks so much, Beckie, for your kind words. I’m glad you enjoyed the walk as much as I did. Walking certainly is a meditation and prayer for me. And yet, the walk invigorates me, too, and allows me to see things I might just pass right by. So it also stimulates my writing. The photography is a way for me to document the moment, and also to share what I see with my readers. Hi Bruce, being from another part of the world, I can only imagine how beautiful your lakeside is. Of course, it helped that you have posted the most amazing photos, the kind I have only read about in my Anne of Green Gables books when I was a kid. What I’m trying to say is that thank you for sharing how beautiful our planet is. God bless you. Thank you, Frances, for your kind words. I’m glad you enjoyed the walk around Lakeside. And, yes, it is that beautiful. The people there are very nice as well. I love the way you paint a picture of the morning unfolding and the beauty around you. I felt like I was there with you. And the pictures are beautiful. Thank you for the beauty around you. Thank you, Angie, for your kind words. I’m glad you enjoyed the walk around Lakeside. 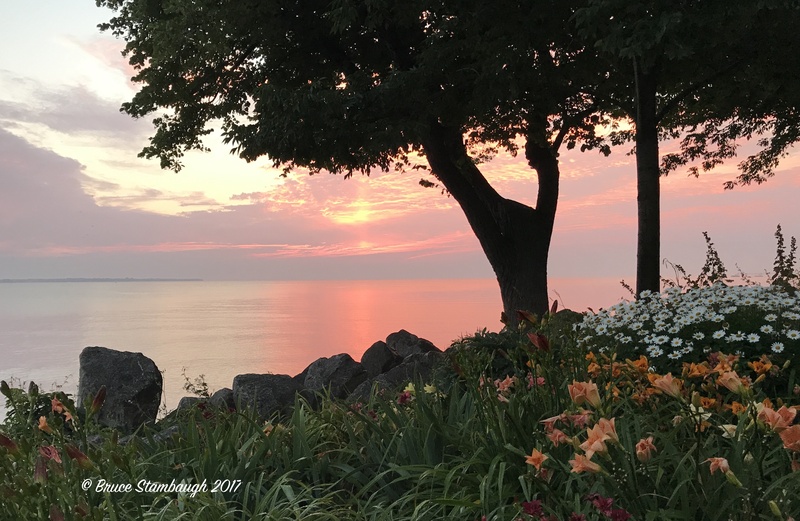 Very rich writing, you captured the soul of the early morning….I spent a summer vacation in Lakeside years ago and forgot how much I enjoyed until reading your posts this week….we’ll have to go back! Thanks, Kevin. Your family would enjoy it.